Photo by Darren Andrew Weimert The Ridge Soaring Gliderport in Julian is home to multiple records set by two Glider Hall of Fame pilots, Thomas Knauff and Doris Grove. Photp by Darren Andrew Weimert Soaring above the Bald Eagle Ridge. Doris Grove will never forget the first time she went up in a glider plane; it changed her life. Already an experienced power-plane flyer, there was something different about being up in the sky with no engine, using the wind and thermal energy to keep the plane in the air as long as possible. Alone in the glider without the noise and power of an engine, it felt as if she was flying like a bird among the clouds, up above the world. While not many people seem to know about it, directly on the other side of the Bald Eagle Ridge from State College sits a runway at the Ridge Soaring Gliderport in Julian that is home to multiple glider records and two Glider Hall of Fame pilots. For a reasonable fee, the two legends will take thrill-seekers up for the ride of their lives. Grove has set multiple records for the longest glider flight ever for a female, while Knauff has held more than 50 glider records through the years, including the longest flight ever. He set that record in 1983 and held it for more than 20 years. 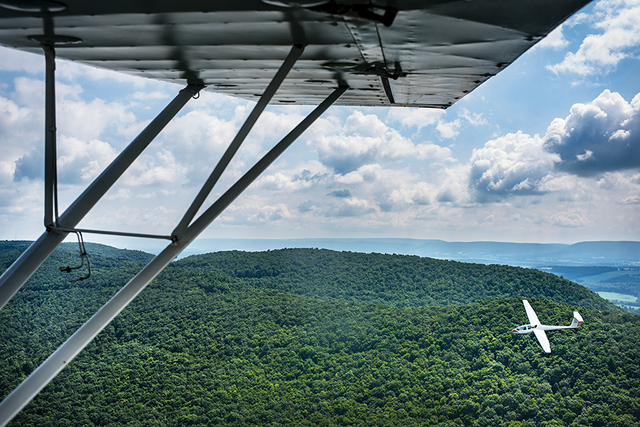 The 1,023-mile flight took Knauff all the way from Julian to Knoxville, Tennessee, and then back again before landing, using the wind and the ridge as his guides. It is the wind and the ridge that make it all possible, according to Knauff. The wind comes from the west, blowing down from the Allegheny Plateau, the high flat land that stretches all the way from the Mississippi River, and comes rushing down into the Bald Eagle Valley before crashing into the ridge and rebounding upward, allowing a glider to stay up in the air for longer than would normally be possible. It is this wind that has carried Knauff and Grove all these years as they set record after record, having the time of their lives along the way. “Setting all those records, it was like a game. We were just out there having fun,” says Grove. The certificates from the records line the wall in the office of the Ridge Soaring Gliderport. At least 20 plaques hang on the wall. There are many more somewhere around the old office. “We used to have them up all around the office, but I took them down when we painted and I just never hung the others ones back up. It was a bit ostentatious, anyway,” says Knauff. The bunkhouse at the gliderport is no Hotel Ritz, but it is not without its charm. With a large 3-D topographical map of the famous ridge that Knauff and Grove have flown through the years, it is amazing to see the scope of their journeys up on the wall. The 15-foot map shows the huge expanse of the ridge all the way from Williamsport to Tennessee. But, don’t touch it. It is precious to Knauff and you can see the memories of flying over all those mountains in his eyes as he tells about his many flights. Bookshelves in the bunkhouse showcase an aeronautical library, and model planes hang in the windows. The carpet and furniture suggest that things in the bunkhouse haven’t changed much since they built the place in the 1970s. A poster for the The Thomas Crown Affair, a 1999 movie starring Pierce Brosnan and Rene Russo, oddly adorns the wall. It seems like a strange decoration for a gliderport bunkhouse, until Knauff proudly describes a glider scene from the flick. He and Grove were stunt pilots for the film. What the bunkhouse lacks in decor, it makes up for in the stories of the interesting people who have flown in to stay a night or two and glide along the ridges. “Most people who are into gliders, well, they are typically interesting people. They come from all around the country to glide here, because it is the best place to do it,” Knauff says. Rick Clarke came all the way from the Eastern Shore of Maryland to be trained by Knauff. After a career of flying for United Airlines, Clarke is happy to take instruction from Knauff. There are only a few other options in the country for glider-pilot training, and it was an easy choice to come to Julian to get trained by Knauff, considering all of his experience, Clarke says. Flying a glider is an entirely different challenge than flying a commercial plane. “Well, first off, you don’t have to worry about 200 passengers in the back, trying to keep them happy,” Clarke says with a laugh. “But the biggest difference is that it is small, and everything that you are doing has to do with you right there in that airspace. There is no air-traffic controller. "Airline flying is a mental game for the most part, but with this kind of thing, you are focusing on trying to fly the plane correctly, because if you do, then you get the thermals and you get it to climb, and it is just you in the plane. Man, what a feeling. Knauff and Grove grew up as neighbors in Pleasant Gap. Knauff always had an interest in flying and remembers trying to make one of his foster brothers’ model airplanes take off by launching it out the window. “Well, it didn’t go anywhere but down, so he was pretty upset about that,” Knauff says. But his love for flying never left him. He joined the Air Force after high school and ended up working on planes. Once back in Centre County, he found a nice job and started a family, but his mind was never off the sky. “I had an office job, and on nice days I would sit there and think, ‘I should be out there flying.’ It was all I could think about,” Knauff says. So, he made it happen, but he needed some help, and it all came back to his old childhood friend, Grove. The old friends were in the State College Glider Club; its planes took off from a runway in Pine Grove Mills. Knauff knew that the best place to fly in the area would be on the other side of the ridge in Julian, as the wind there was perfect and would allow for some excellent gliding conditions. He needed a partner, but also needed some convincing that Grove was the right person for the job. The pair eventually started a business with great success. After a few tries, Grove eventually agreed to marry Knauff, and their perfect business relationship carried over to married life. Knauff has been flying this ridge since the 1970s. He can’t even comprehend how many flights he has taken in a glider, but while up in the air with him, a passenger can tell that the 80-year-old still enjoys it as much as ever. There really is some kind of wonderful magic involved with flying through the air in a glider plane. The wind rushes trough the cockpit as you fly along a ridge and look out over two valleys for miles and miles in any direction. The glider takes you up higher than the tallest mountains, and up near the clouds, soaring like an eagle, rising somehow without an engine pushing you higher. With no sound except the wind, it is impossible not to think back to childhood dreams of flying through the air like a superhero. Birds sail past, riding the same wind that you are in, and the whole world is spread out below you. From the rush of takeoff – towed by a plane under power – to the thrill of the landing, the whole ride is an experience that a rider won’t soon forget. Knauff loves sharing this magic with new people, and telling them how it works. The 84-year-old Grove is the same way; neither can imagine a different life. “I just love it; I don’t ever want to stop. It is just so much fun out here flying,” Grove says. 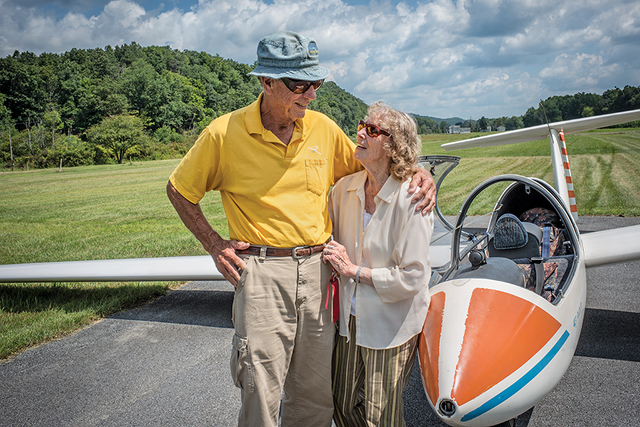 But the chances to fly with these two glider champions here in Centre County are dwindling. They are hoping to sell their business and focus on gliding for themselves. There is still time to get out there and go up in the sky and soar with a legend before they sell, however. And Grove says that whoever they eventually sell to will have to keep the property as an airport of some sort, and since they live up the road, they surely will be down to soar into the sky they know so well.